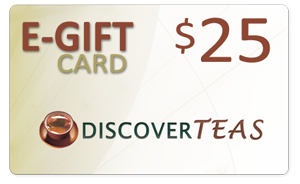 Discover TEAS $25.00 gift card. This is the perfect amount for someone wishing to try a few ounces of 1 or 2 teas. Valid 1-year. 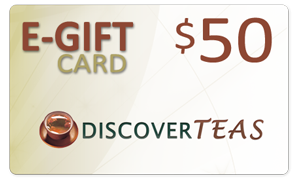 Discover TEAS $50.00 gift card. With this gift level, select couple of fine teas and compliment with a small steeping system. Valid 1-year. Discover TEAS $75.00 gift card. This gift is for the connoisseur or tea lover! Give the gift of several of our great teas and a steeping system with an added benefit, Free Shipping! Valid 1-year. Discover TEAS $100.00 gift card. The ultimate gift for any tea lover. With this card, your gift recipient will be able to fulfill many wishes and dreams, and get Free Shipping! Valid 1-year. Select desired card and enter the recipient's name and email address. Upon completion of the transaction, gift card recipient will receive an email containing a special gift code for use during order checkout. 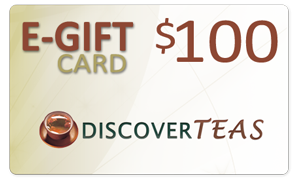 GiftCards must be redeemed online at discoverteas.com. Should your recipient not receive gift code, please have him or her check their email SPAM folder.